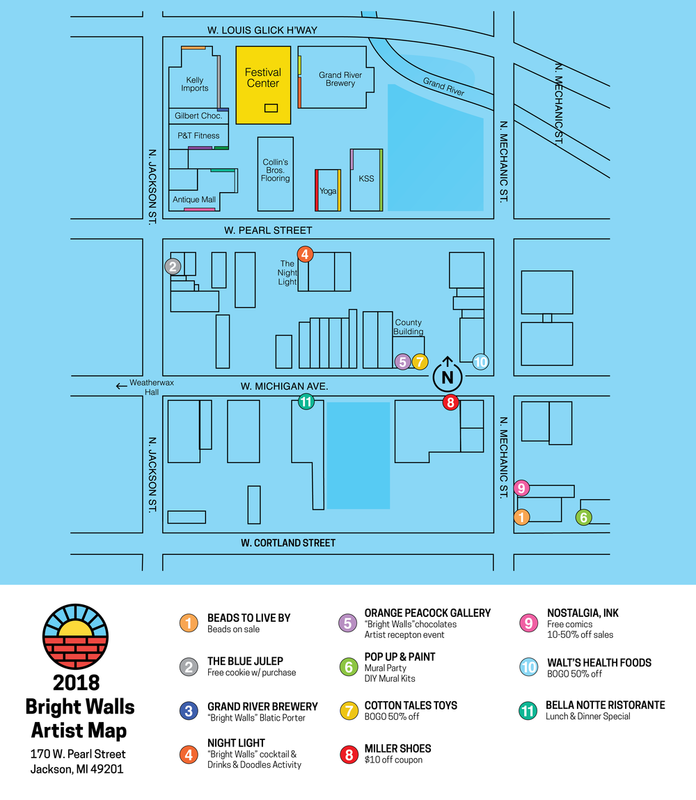 Beads to Live By: A collection of their most brightly colored beads will be on sale in various shapes and sizes in honor of the Bright Walls Mural Festival! Get inspired by the murals at "Bright Walls" and then continue your creative weekend by coming over to Beads to Live By. The Blue Julep: Bright Walls logo on sugar cookies. With every $10 purchase The Blue Julep will give away a Bright Walls sugar cookie. The promotion will last as long as there are cookies available. Grand River Brewery: The “Bright Walls” Baltic Porter (7.5%) releases on October 4th. Small batch brew exclusive for the Bright Walls Mural Festival. Night Light: Drinks & Doodles from 7-11pm (materials provided) with LIVE entertainment by Jason Cross from 8-11pm. Special “Bright Walls” cocktail will be available as well. The Orange Peacock Gallery: AG Chocolates will release a limited edition “Bright Walls” flavor. Available only while supplies last. Join us for a special artist reception 4p.-6p. to meet the chocolatier and enjoy a complimentary glass of wine or beer. Also, available for sale will be the newly release book by Bright Walls muralist, Adele Renault. Pop-Up & Paint: Join us for a mural paint party October 5th and our special on DIY Mural Kits available all day for purchase. Miller Shoes: $10.00 off coupon on a pair of shoes. *Must present coupon for offer* Coupon can be found in the Salesman.